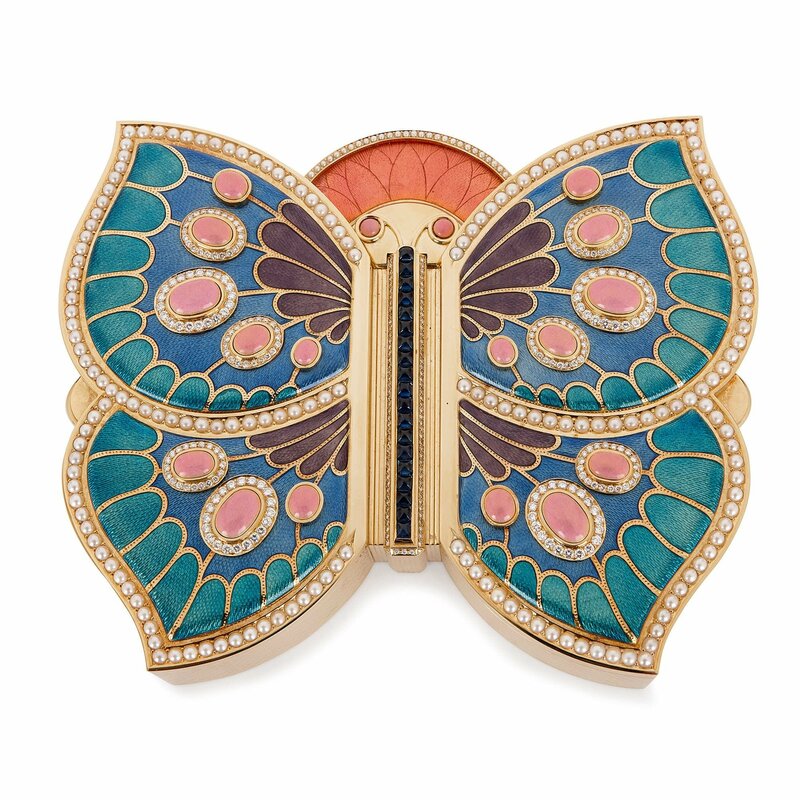 This exquisite butterfly-shaped, 18 karat gold box has been beautifully decorated with colourful guilloché enamels, and inlaid with pearls, diamonds and sapphires. 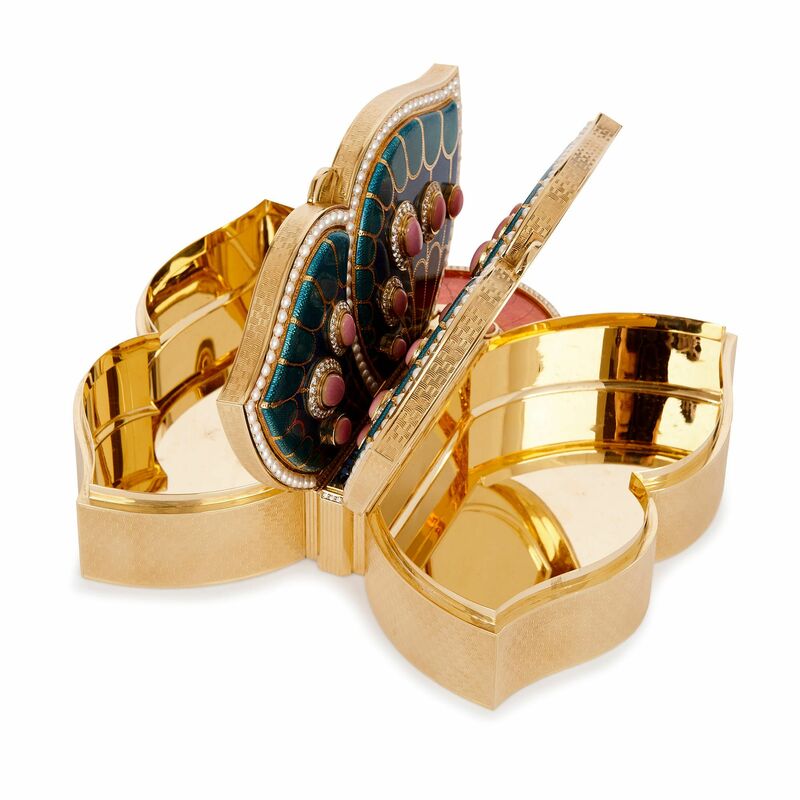 The gold box takes the form of a butterfly with purple, blue and turquoise guilloché enamel wings. 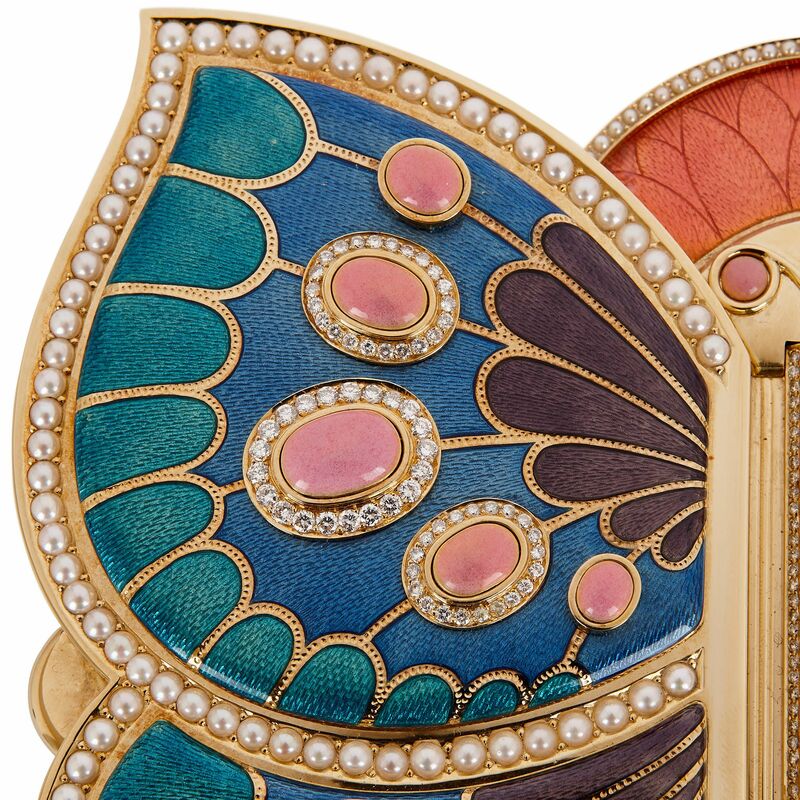 The wings are further decorated with light pink enamel medallions, which imitate precious stone cabochons. 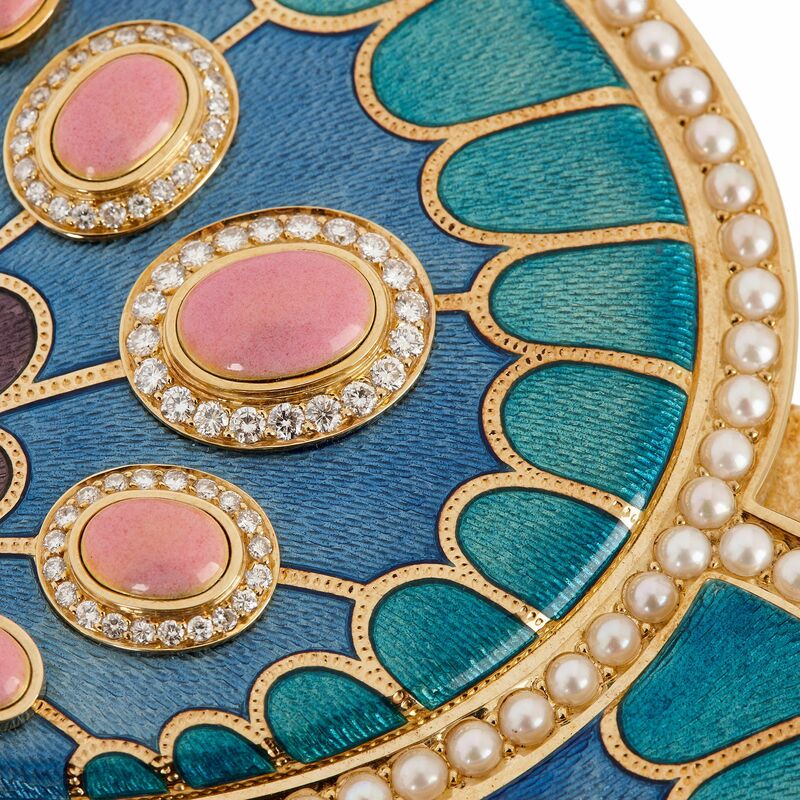 These medallions are encircled by diamonds. 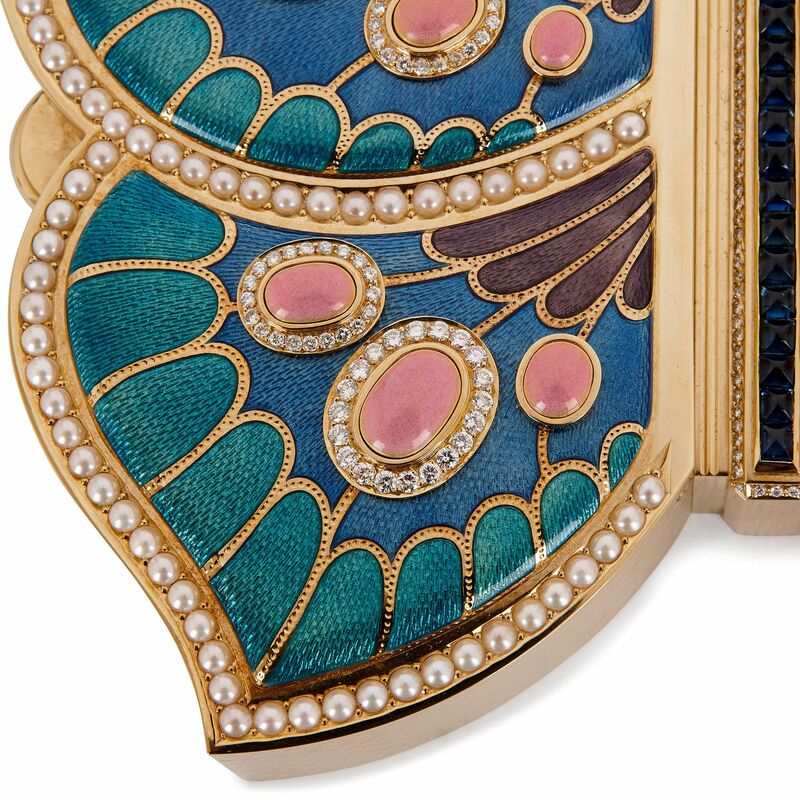 Bands of pearls outline the wings, and a line of sapphires decorates the butterfly's body. 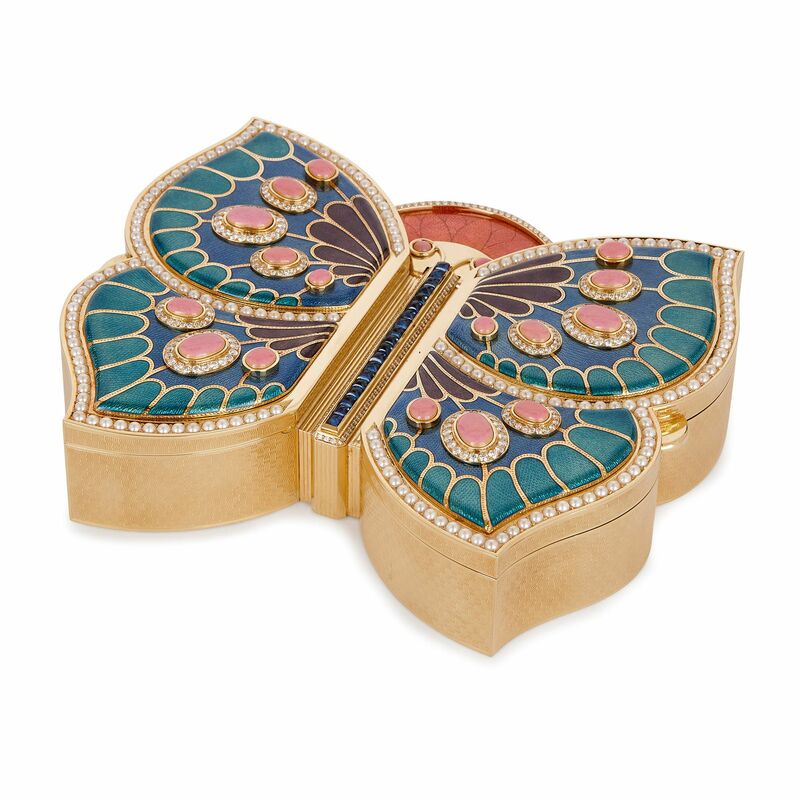 The pink enamel antennae are set against a gold background, placed before an orange guilloché enamel flower, with a pearl border. 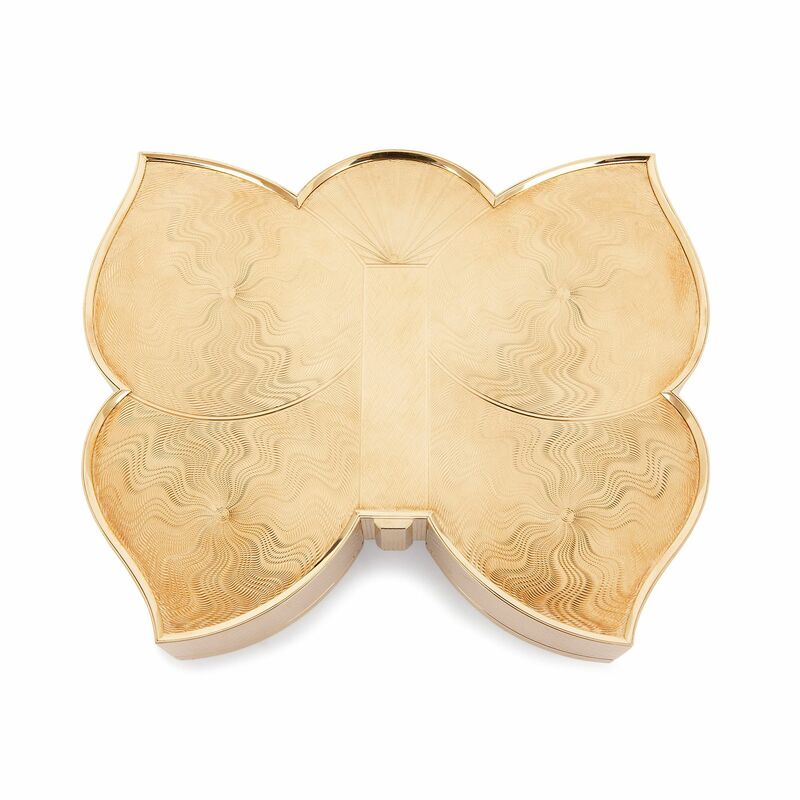 Each of the two wings lifts up on a hinge to reveal a small gold compartment, perfect for storing precious jewellery. 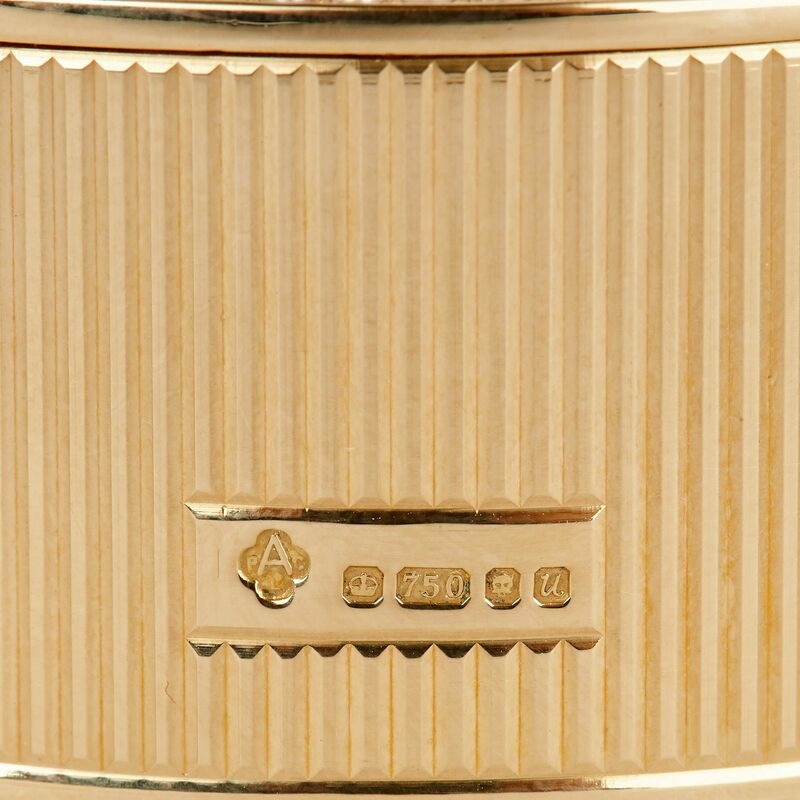 The gold box is fully hallmarked and includes the Asprey Plc maker’s mark. Established in England in 1781, Asprey is a leading producer and retailer of fine jewellery and luxury goods. The company create bespoke pieces for royalty, both in Britain and abroad, and for an elite clientele. 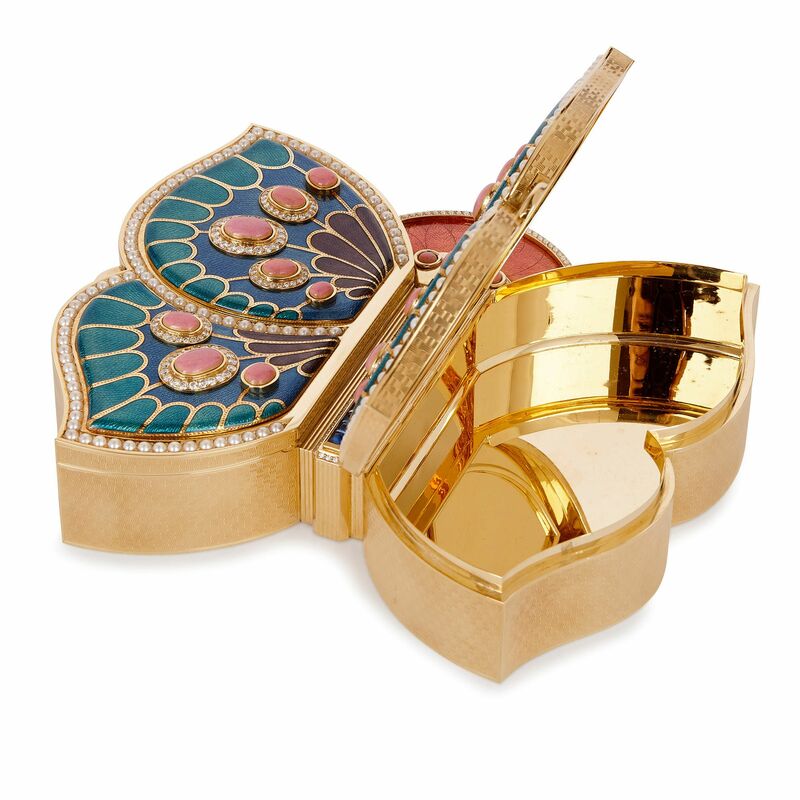 The gold box was retailed by Garrard & Co, the prestigious English jewellery and silverware manufacturer. 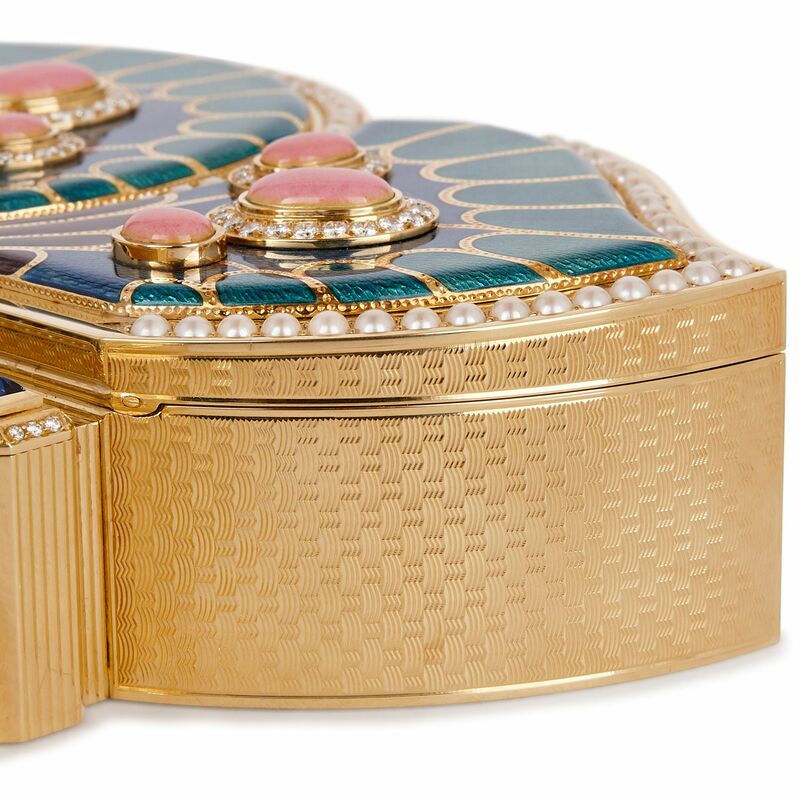 When the box was made, in 1994, Garrard & Co held the title of Crown Jeweller, and had done since 1843.